Gabrielle Moulère (sometimes Moller), and her sister Jeanne were among the best known practitioners of les grands secours, made famous - or notorious - largely through Montgeron's account and the set of anonymous engravings included in Book 3 of La vérité des miracles. Gabrielle was born in Paris on 10th March 1722, rue Saint-Victor, in the parish of Saint-Nicolas-du-Chardonnet. Her father was a cobbler. 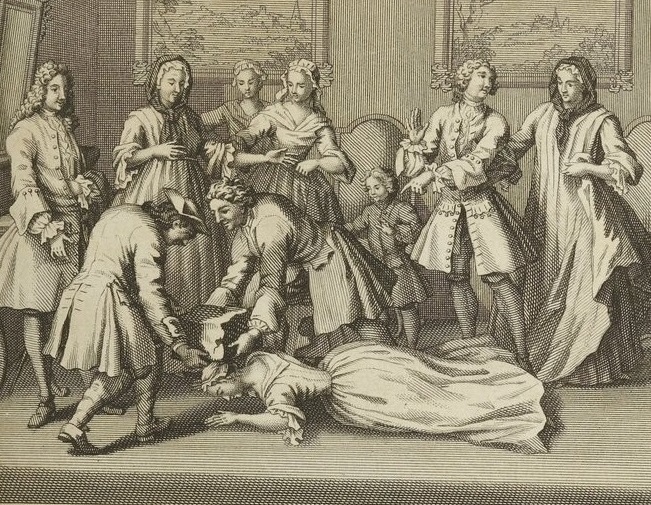 There were five children in all - Jeanne (born 1712); Marie (born 1715); Jean (born 1719); Gabrielle (born 1722) and Louison (born 1728).The whole family were involved in the oeuvre des convulsions, with Madame Moulère assisting at the secours of Jeanne and Gabrielle, in their own home or at the houses of their rich adherents. Gabrielle was scarcely in her teens at the time. 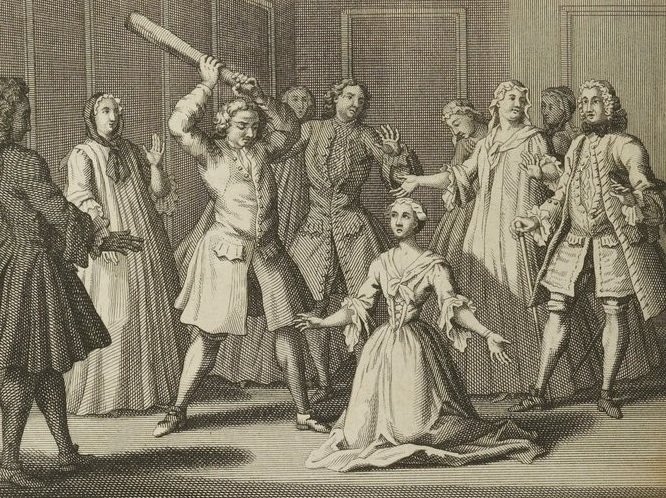 The girls rapidly ran foul of the authorities: Jeanne was arrested at the home of the marquise de Vieuxpont on 22 November 1737 and Gabrielle on October 30th 1738 (according to some sources 1739) at the country house of M. d'Arginvilliers in Lardi. After a brief spell in the Bastille, they were incarcerated in La Salpêtrière and, in Jeanne's case, in Sainte-Pélagie. Gabrielle was to languish in prison for nine years. Despite the inevitable accusations of hysteria or deliberately manipulation of her well-to-do patrons, Gabrielle's commanding presence and sincere belief in her mission were widely attested. Sympathetic eye-witnesses were deeply impressed by the power of her prophetic gifts. 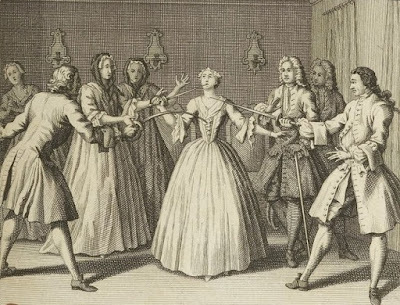 She refused steadfastly to abandon her faith in the secours, preferring to remain in the harsh confines of La Salpêtrière where she died at the age of only twenty-six on 29th March 1748. After her death she was venerated as a Jansenist saint and the miraculous cure of one Mlle Cécile d'Achon, daughter of an advocate of the Présidial in Nantes, attributed to her intercession. From the age of nine or ten, she was in the habit, in the evening when she returned home to her mother, of kneeling beside her bed before a Crucifix to pour out her heart in fervent prayers which she composed herself on the spot. It was while occupied in this saintly exercise, that she was taken with her first convulsions, on the 10th April 1734. In the midst of her prayers she fell into an ecstasy; she believed she saw and heard the Blessed Pâris and M. Desangins who exhorted her to submit with full confidence to the will of God, making the sign of the Cross over her. Since she replied to them out loud, her mother asked to whom she was speaking. She replied that it was the Blessed Pâris and M. Desangins. Her mother was astonished at her reply and, scrutinising her, saw clearly that she was in a supernatural state. After this ecstasy, Gabriel continued her prayers with even more fervour than before. Her mother, seeing that she was not going to stop even though it was late into the night, ordered her to bed. She obeyed but as soon as she was in bed she felt a sort of violent wind that pushed her out and on to the floor. She declared to her mother that henceforth she would no longer sleep on a bed but on the floor, fully dressed, summer and winter, until God ordained otherwise. Indeed, from that day on she slept on the ground, until the 30th October when she was confined to the Bastille; and on Sundays and Feast Days she didn't go to bed at all but passed the whole night in prayer, God having relieved her of the need for sleep. She told her mother that the supernatural state, that God had caused her to enter, was a state of penitence, and warned her that she no longer needed trivial comforts, because she must follow promptly everything which God ordered. M. le curé de S. Germain, her confessor, told everyone that she was not a girl but an angel, whose thoughts and every action were formed by God. Court récit de la vie et des secours de Gabrielle Moler (1749), p.161-5. In the succeeding feats, Gabrielle commanded her assistants to stab her repeatedly with a heavy pointed iron bar, and to smashed her face into the floor by allowing a stone weighing sixty pounds to fall on her. A series of four engravings highlight the weirdness of the proceedings. Although these are not generally attributed to the pen of Jean Restout, they follow his example in emphasising the respectability and restraint of the protagonists. The final illustration shows the famous secours des épées of 1736, which was acknowledged as Gabrielle's particular invention. Supposedly guided by supernatural forces, Gabrielle pushed a sword into her stomach; Instead of piercing her body, the blade merely curved, leaving Gabrielle herself unscathed. Later she wielded the sword against her throat to similar effect, and finally swallowed the tip down into her esophagus without injury. All these exploits, Montgeron emphasises, were carried out repeatedly and openly in homes of her adherents, with the upmost decorum. He himself was convinced of their divine provenance. Gabrielle herself articulated their religious significance; her acceptation of violence constituted a tableau vivant, representing the sufferings of the disciples of Elijah and figuring the spiritual invulnerability enjoyed by servants of the truth. The plates are accompanied by a quotation from Exodus III, iii. on the miracle of the burning bush - flaming but invulnerable - which embodies God's promise to deliver the Children of Israel. 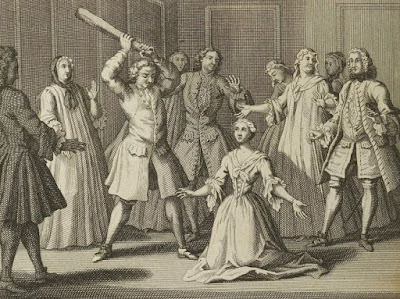 The 30 October 1738 she was arrested at Lardi at the home of M. Dangervillers. 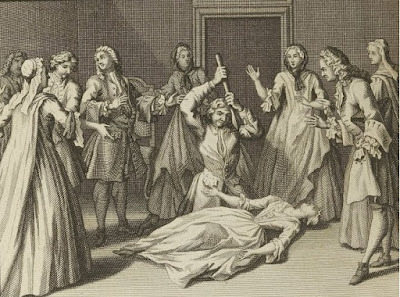 She was just over sixteen-and-a-half years old; she had experienced convulsions for four-and-a-half years, the most violent for more than four years. When she was on her deathbed and could no longer speak, a priest who was one of her persecutors, took her hand to make her signal that she renounced, Paris, the miracles, convulsions and secours. But Gabriel shook her head from right to left and left to right. 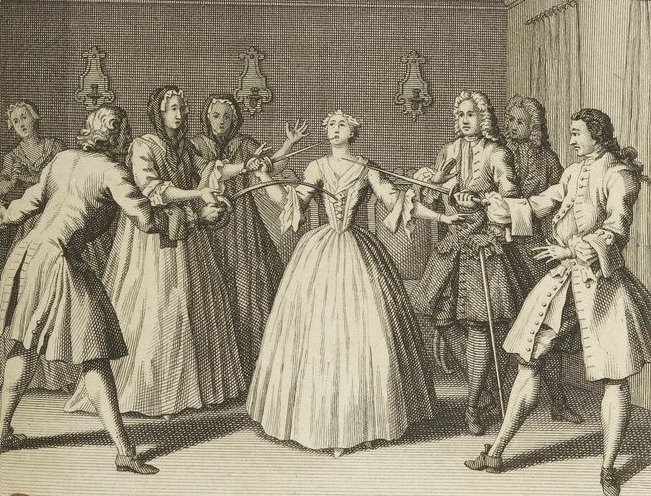 Court récit de la vie et des secours de Gabrielle Moler(1749), p.173-9. "Court récit de la vie et des secours de Gabrielle Moler"
I give below the account derived from Carré de Montgeron, which is on every point confirmed by the pamphlet entitled: "Vains efforts des mélangistes." The two hostile parties unite in attesting the following facts, that are supported, moreover, by numerous certificates. "It is a matter of daily experience" (I quote, now, from Montgeron), "that the convulsionaries are more or less relieved in proportion as the blows administered are more or less heavy. . . . It has been proved by innumerable witnesses that when they are violently struck in the pit of the stomach with an iron instrument (this is one of the secours they most ordinarily demand), the instrument buries itself in their body, sometimes appearing to penetrate as far as the spine; and the further it enters into the stomach, the more relief the convulsionary experiences. "The author of Vains efforts says : 'Jeanne Mouler, a young woman of twenty-two or three years of age, having supported herself against the wall, one of the stoutest men seized a firedog, weighing, it was said, twenty-five or thirty pounds, and struck her powerful blows in the stomach. This operation was repeated on various occasions, and at one time more than a hundred blows were counted. Another day, having given her sixty, he tried the effect of similar blows on a wall, and it is stated that at the twenty-fifth blow, he made an opening in it.' . . . The fire-dog here in question weighs twenty-nine or thirty pounds. It was with this instrument that the convulsionary submitted to the most terrible blows in the very pit of the stomach. ... I declare that I am the man of whom the author speaks as the brother who tried on a wall the effect of blows similar to the ones he had just given to this convulsionary. ... It was in vain that I employed, throughout, all the strength I could exert to redouble the weight of my blows ; the convulsionary complained that they procured her no relief. She compelled me to give the fire-dog into the hands of a very large, strong man, standing among the spectators. This person did not spare her. Instructed by my experience, that the blows could not be too violent, he struck her with so much force in the pit of the stomach, as to shake the wall against which she was leaning. The convulsionary made him give her in succession the hundred blows she had at first demanded, counting for nothing the sixty received from me." . .
"'The exercise of the plank succeeded,' continues the author of Vains efforts. 'They placed upon the convulsionary, lying on the ground, a plank which entirely covered her; then, as many men mounted on this plank as it could hold. The convulsionary bore the weight of them all.' . . . More than twenty men have been seen gathered together on this plank, which was supported by the body of a young convulsionary. .... The body of this girl resisted the weight of more than three thousand, sometimes more than four thousand pounds— more than sufficient to crush an ox." . . .
"' The Salamander,' says the author of Vains efforts, ' cried: "Barley sugar!" This barley sugar was a stick thicker than the arm, sharp and pointed at one end. The convulsionary, in the centre of the chamber, curved her body in the form of a bow, and, balancing herself by her hands, rested on the point of the barley sugar; in this position, she cried out, 'Biscuit! Biscuit!' This was a stone weighing about fifty pounds. It was attached to a cord which passed through a pulley nailed to the ceiling of the room. Raised to the pulley, it was several times allowed to- fall on the stomach of the sister, her loins bearing all the time on the barley sugar.' . . . Neither the skin nor the flesh received the least injury, or suffered the slightest pain." "A certain convulsionary receives, three time a week, the most terrible secours. Seated on the ground, the back against the wall, she induces those who come to witness her convulsions, to kick her in the stomach two thousand times in succession. . . . Extended on the ground, she causes herself to be violently struck with billets of wood on every part of the body. . . . Standing erect, her back against the wall, she takes a spit used in roasting meat, the strongest she can find; she places its point against the pit of her stomach, in the region of the short ribs; she then makes four, five, and six persons push against it, with all their strength, so that the spit bends perfectly crooked. . . . She sometimes puts the point of the spit to her throat or her forehead. ... In short, for the last two months, she has submitted every part of her body to sword thrusts. . . . Although her skin is indented by their points, and a slight red mark sometimes remains, yet the flesh is never cut." . . .